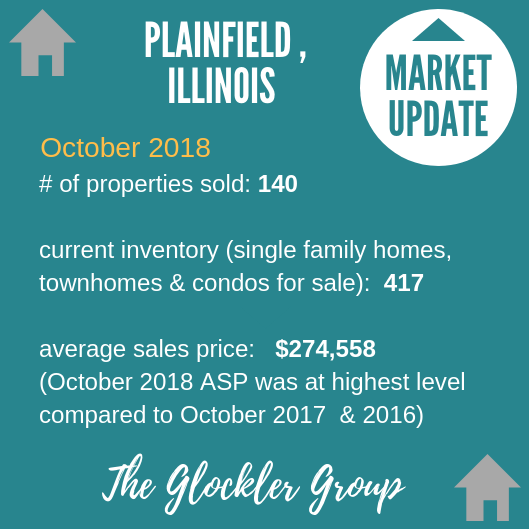 Here is the Plainfield, Illinois residential real estate market update for October 2018. The Average Sales Price in October was $274,558, up 6.1% from $258,810 in October of 2017 and up 3.9% from $264,215 last month. October 2018 ASP was at highest level compared to October of 2017 and 2016. The number of New Listings in October 2018 was 231, down -8.0% from 251 last month and up 12.1% from 206 in October of last year. Thinking of buying or selling in Plainfield? Let us put our four decades of award-winning experience in the local market to work for you. Contact us here. Click here to view properties for sale in Plainfield.